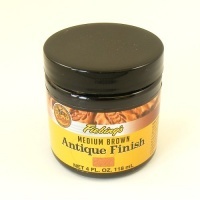 Fiebings Antique Finish gives a beautiful two-toned patina to undyed veg tan tooling leather, and is excellent for highlighting the detail in your carving and embossing projects. To use, apply heavily in a circular motion and then remove excess immediately from the raised portions of the leather, leaving an accumulation of paste in the perforations and depressed areas. A ruler wrapped in cloth works very well for this part of the process. Excess paste may be re-used. 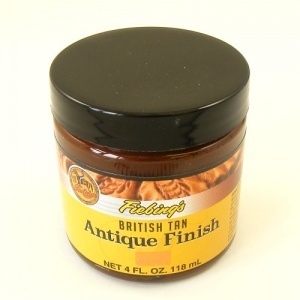 Once it is dry, you can then buff with a soft cloth to remove any loose finish. 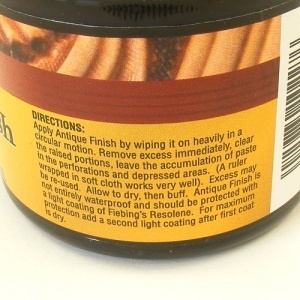 You will then need to seal the surface with Fiebings Resoline, applying one thin coat, letting it dry and then applying a second coat for maximum protection.